As mentioned in my previous post, we’ve been in Florida for the last week as an attempt to relieve ourselves from the negative temperatures that the Midwest can’t seem to shake. The week has been filled with lazy mornings at the beach, afternoons by the pool, and early evenings were spent exploring the Everglades. More on our adventures later this week after I finish editing all the photos I managed to snap. As for now, I tried to spend the whole week relaxing but couldn’t resist the urge to document these popsicles to share with all of you. I received both an ice cream maker and popsicle molds for Christmas and although I’ve played around with a few recipes, the Midwest ground has been covered in snow since December and our home has maybe seen the sun half a dozen times since the new year. Thus, ice cream cravings have been at a standstill (well, at least until last week when we headed to the coast). I had full intentions of dragging my ice cream maker halfway across the country to enjoy some vegan chocolate cinnamon or roasted blueberry ice cream but my boyfriend put his foot down and might have called me something along the lines of crazy. So, instead, I reluctantly put the ice cream maker back into the cupboard and snuck my popsicles molds into my suitcase. 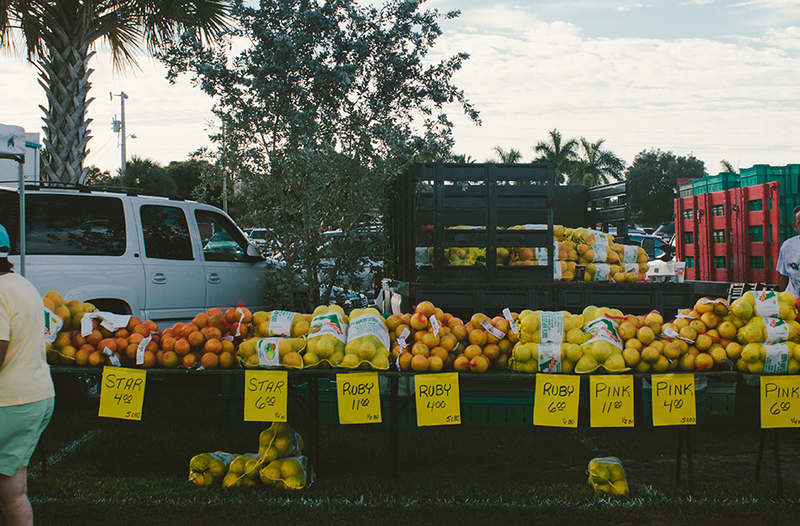 I knew that I wanted to make some popsicles out of Florida’s legendary citrus and spent most of the week on the look out for the best oranges, lemons, and limes I could find. 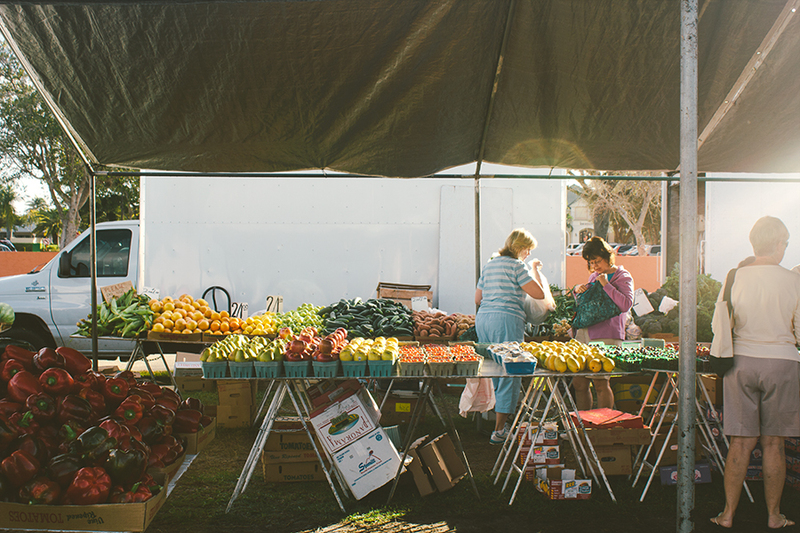 Luckily, we lazily wonderers over to the farmer’s market on wednesday morning and left carrying bags full of citrus, vegetables, cheese, and even some saw palmetto honey. The entire week spent in the Everglades was sunny and in the 80s. I dare to say that it even may have felt too hot at times and we’d come back from the beach every afternoon dehydrated and starving. 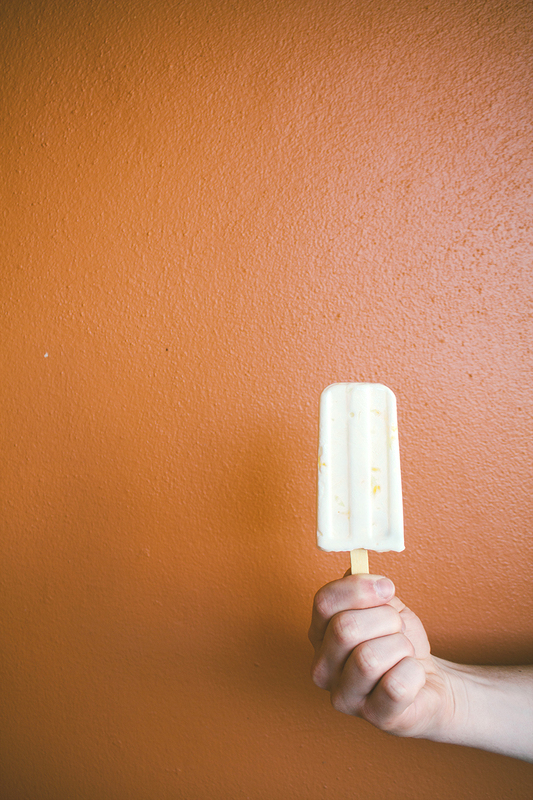 These popsicles were the perfect afternoon pick-me-up snack after an exhausting morning by the ocean. I used greek yogurt in these for the protein boost but I bet they would be delicious with coconut cream as well. I also used honey as the sweetener since I picked up the saw palmetto honey at the market and wanted them to be as healthy as possible. However, feel free to substitute in regular sugar if they aren’t sweet enough for you. Also, agave would be the perfect honey substitute if you are trying to make these vegan (and use vegan yogurt instead of greek). The last note I’m going to make is that you should feel free to roast any citrus you’d like for this but I noticed that the limes were a bit tart for my tastebuds and tended to enjoy the tangerines and oranges the most. special equipment: popsicles molds (I have this one) and 10 popsicle sticks. Preheat oven to 350 degrees and line a baking sheet with parchment paper. 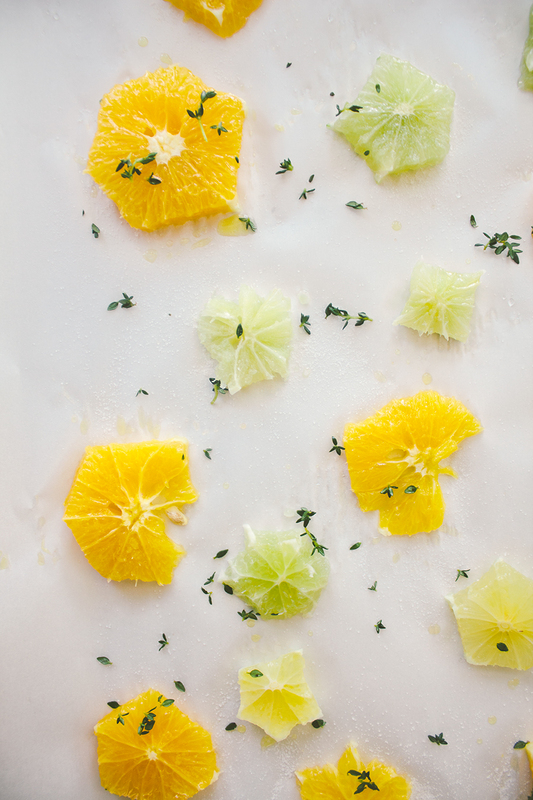 Lay the citrus and thyme in one layer on the baking sheet and drizzle with the olive oil and 1 tablespoon of honey. Sprinkle the salt and sugar and roast for 20 minutes. Remove from oven and let cool. Once cooled, chop up the citrus into bite size pieces and make sure all seeds are removed. Mix together the citrus, thyme, 3 tablespoons honey, and greek yogurt. Taste and add more honey if not sweet enough (or, if too sweet, add a little lemon juice). 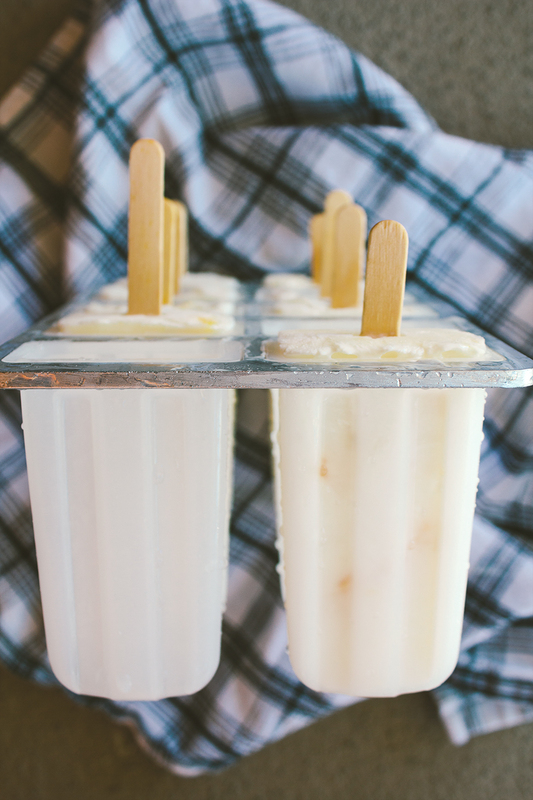 Divide between your popsicle molds, stick the stick in according to the popsicle molds directions, and stick in the freezer until completely frozen. Enjoy after a long day in the sun or for breakfast on your way out the door. Looks awesome, will try when it warms up in our north. My son made, celery & green apple popsicles last summer. Very refreshing w/ no dairy. 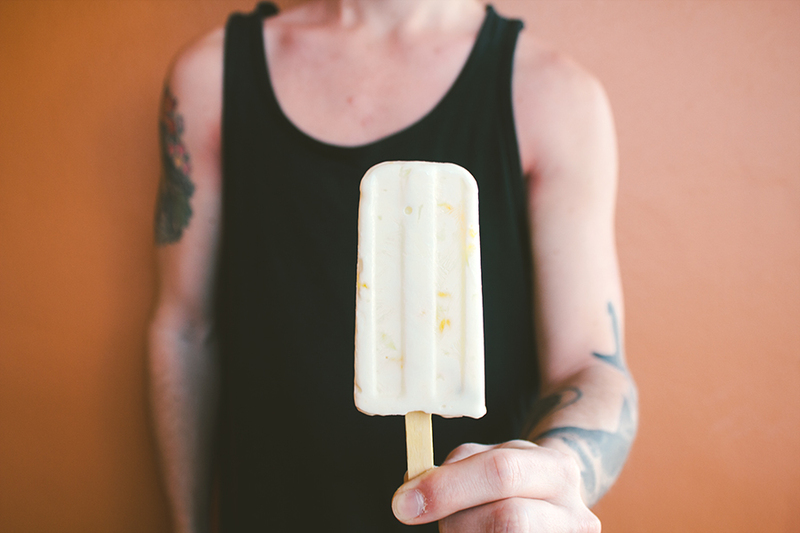 I can tell I’m not the only one who makes my boyfriend be a hand model for my food pics 😉 I could use lots of these popsicles right now since I’m melting in the Mexican sun! looks delicious! 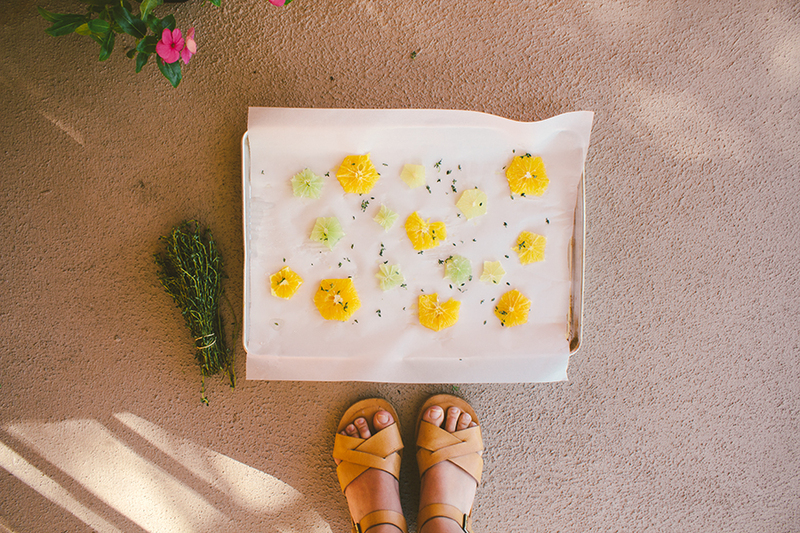 i love how you always find creative uses for thyme! Yummmmmm…these look awesome. Such a stellar idea. 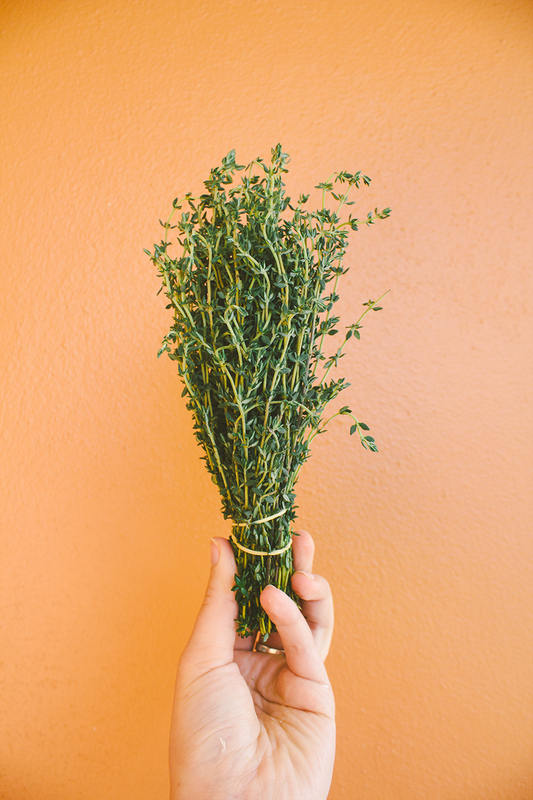 Also, thyme should go in everything! loving this so hard. citrus babes for life! this is such a lovely reprieve from the glut of winter foods out in the world right now. a nice brain break, getting me reading for spring. i’ll be making ice cream before ya know it! & of course can’t wait to make these. I absolutely love that you packed popsicle molds in your suitcase and took them on vacation. You are my hero. These look simply gorgeous. I’m glad you could escape the cold and thaw a bit! I can’t wait for longer and warmer days and popsicles just like this! just gorgeous. and lucky you! being in florida! ps. how long are you guys in the area? georgia is just a state away! These look amazing! Love this combination. here I thought you were deep in a winter wonderland… what fun photos and the sandals! Ha, only food bloggers would understand the urge to drag large pieces of kitchen equipment on trips, I know I’ve had that urge before. I hope you’re enjoying your vacation! 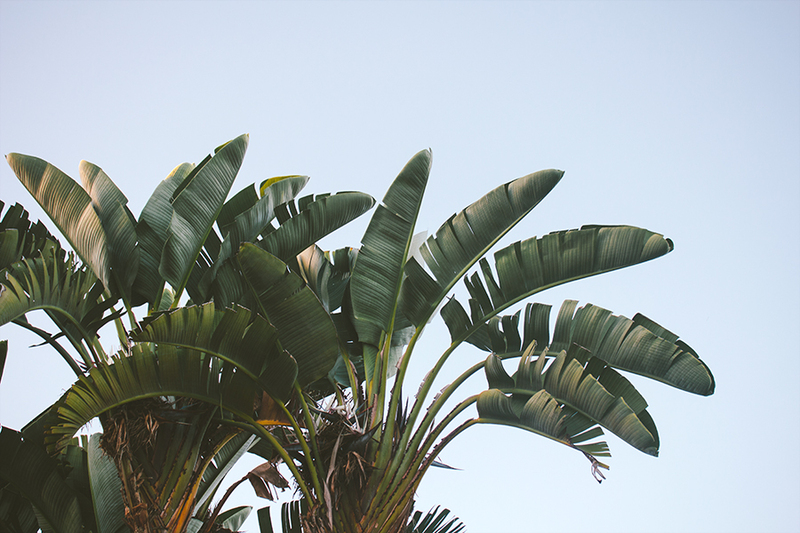 This post makes me crave summer so unbelievably much! I’m, however, glad to see how the daylight and sun slowly return. I can almost feel the spring air in my lungs already… Love the pictures and the recipe as well as the fact that you carry popsicle molds with you.